Oh the Cat commercial is so amusing! 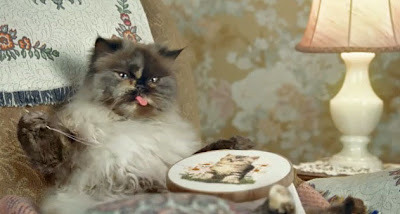 I wonder why they let the goofy cat (with the tongue) do the embroidery bit? Or does it mean it's really concentrating on it's cross stitch? You can also make the skirt from gathered ribbon or lace in layers:) That's what my Grandmother would do when she didn't want to make crocheted skirts. Thanks for sharing this & LOVE the cat!! Well, this cat looks sucha very funny and good to share with us, this types of images, really I enjoyed fully.